Rafns' Restaurant: Golden Ticket promotion is going on now! Golden Ticket promotion is going on now! Rafns' has joined 33 downtown businesses in the Golden Ticket program, which lasts until the end of the year. Here's how it works: When you spend $15 or more at Rafns', you receive a Golden Ticket. You can redeem the Golden Ticket at our shop and get 15% off your next retail purchase, or you can bring it to any of the other participating businesses. Each business is offering its own discount or promotion when you apply it to a purchase. You can collect as many tickets as you like and use them throughout the month of December. 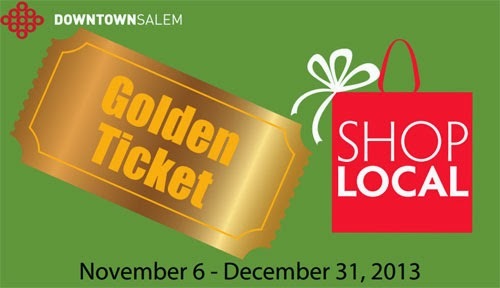 Be sure to use the Golden Tickets when shopping downtown for the holidays! *Discount excludes poultry and bison.